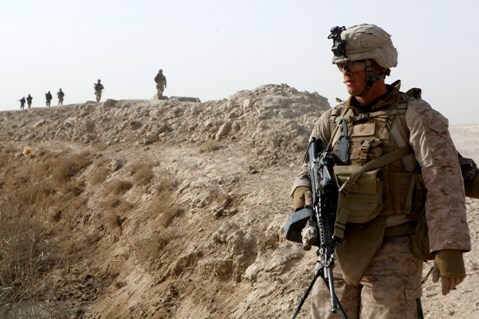 You are at:Home»Afghanistan»Could drawdown in Afghanistan begin with Marines in Helmand? Last week during an interview with Maj. Gen. Richard Mills, the outgoing Marine commander of Regional Command-Southwest, I asked for his thoughts on something hanging over everyone’s head in Afghanistan: The planned drawdown of U.S. forces. That decision will be made at a level much above mine. The way I see it, there will be a thinning out, a gradual reduction of coalition forces within a given area and a gradual turnover of security and responsibility. Rather than having a band and parade out of town, I think we’ll do it as a gradual process until one day people look around and say, ‘Hey didn’t Marines used to be around here somewhere?’ Again, the number of forces will depend on a number of high-level decisions. We’re anticipating being able to take some of that dividend and being able to apply it to other places within the province, the fringes of the province, where we could use some more forces. The border jumps out at you. It’s a big issue, a big problem, and there’s a lot of terrain down there. That measured response doesn’t exactly square with all the options reportedly being discussed at International Security Assistance Force headquarters in Kabul and at the White House, according to a story in this morning’s Washington Post. It reports that President Obama is still eyeing a “meaningful” withdrawal in Afghanistan beginning this July, and Helmand province — better known to some as Marine-istan — is one of the regions in play. Those details raise plenty of questions about what’s coming. First, how will Marine commanders in Helmand plan for the departure of Battalion Landing Team 3rd Battalion, 8th Marines? The Post story doesn’t label the unit, but it certainly would appear to be the “750-strong Marine battalion” that officers mentioned. About 1,400 Marines with the 26th Marine Expeditionary Unit, out of Camp Lejeune, N.C., deployed from Navy ships to Afghanistan in January, and Mills said it’s still expected they will “return home in time,” which would remove them from Afghanistan soon. Second, will that be good enough for the White House? The MEU wasn’t a part of the initial 30,000-troop surge announced in December 2009, which included an additional 8,500 Marine forces. How long will it take until improving districts in Helmand like Garmser and Nawa are targeted for drawdowns, too?